Fed Chair Janet Yellen will testify on monetary policy on Tuesday and Wednesday. These appearances are less traumatic for the financial markets than they used to be. The Fed releases minutes of the policy meetings on a timelier basis and the Fed chair holds press conferences after every other meeting. Hence, it’s unlikely that we’ll see Yellen signal a major change in the policy outlook. Still, the financial markets will pay attention. The minutes of the January 27-28 policy meeting helped to clarify the outlook for monetary policy. Officials continued to prepare for policy normalization, as they worked on the technical details. The financial markets are more concerned about the timing of the lift-off – that is, when the Fed will begin to raise short-term interest rates. However, policymakers were briefed not just on possibilities for the timing, but also on the pace of rate increases. The minutes did not go into details on what the Fed staff presented or what conclusions may have been drawn, if any. Note that in her press conference in mid-December, Yellen cautioned against assuming that the Fed would raise rates at “a measured pace” (that is, 25 basis points per meeting) once tightening begins. She also emphasized that the FOMC could decide to begin raising rates at any meeting, not just the ones that have a post-meeting press conferences. So, the Fed could wait longer and raise rates more rapidly once it starts, or make larger moves on an irregular basis. Indeed, Yellen previously emphasized optimal control theory, which “calls for a later lift-off” of policy tightening. 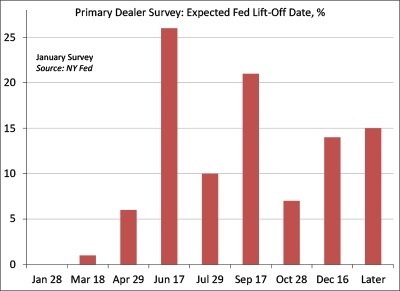 Prior to each FOMC meeting, the Fed surveys the primary dealers, asking questions about the timing of policy firming and about the outlook for the economy and financial markets. In January, responses on the timing were all over the place, but with more than half between June and September. This is roughly consistent with the range of forecasts of the year-end federal funds rate made by senior Fed officials in December. 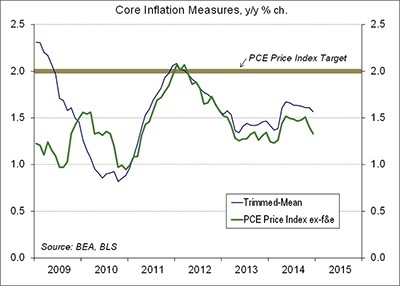 The low inflation does not mean that the Fed won’t hike. Yellen indicated that the Fed could still raise rates as long as there is a strong expectation that inflation will move toward the 2% goal. The Fed has described the impact of lower energy prices as “transitory.” However, lower energy prices are likely to help push core inflation down in the near term. Low inflation is also a consequence of a soft global economy. Yet, lower energy prices should help the rest of the world to eventually recover. However, the timing isn’t clear. Estimates of European growth have picked up a bit recently, due to the drop in energy prices, but there are a lot more issues in the global economic outlook besides energy. Note that the Fed does consider the impact of a stronger dollar on growth and inflation. However, the exchange rate of the dollar is not the Fed’s responsibility (that’s the Treasury’s call). The Fed is not going to refrain from raising short-term interest rates to weaken the dollar. Does it really matter when the Fed begins to tighten? The timing has some minor implications for longer-term Treasury yields, but it’s much more important for the middle of the curve. Forecasting the pace of policy normalization ought to be just as important as getting the start date right. Winter of discontent or winding the spring? Retail sales figures disappointed in December and January. The Bloomberg/University of Michigan Consumer Sentiment Index fell back in mid-February. This news has cast some doubt about whether the drop in gasoline prices will propel consumer spending growth in the near term. However, economic data are notoriously unreliable in the winter months. The spring economic data reports should provide a better picture of the underlying strength in jobs, consumer spending, and housing. Seasonal adjustment is often difficult, but is especially challenging in the winter months. Prior to seasonal adjustment, core retail sales (which exclude autos, building materials, and gasoline) rose 20.2% in December and fell 24.9% in January. The total for the last three months was up 4.6% y/y. The impact of lower gasoline prices shows up with a lag. Prices fell more sharply in January, but have now risen off their lows. That’s not a surprise. 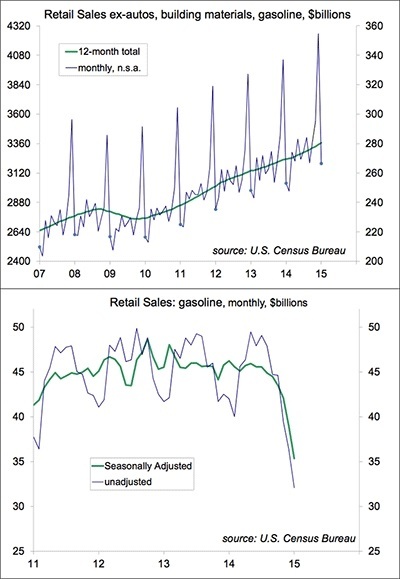 Gasoline prices normally rise from December to May and then trend lower in the rest of the year. The drop in gasoline prices has freed up about $10 billion per month to spend on other things. Note that the household sector typically pays down debt in January and February, making up for its holiday season generosity. The drop in gasoline prices should speed that adjustment and consumers will be better able to spend in March (the early Easter ought to boost spending). 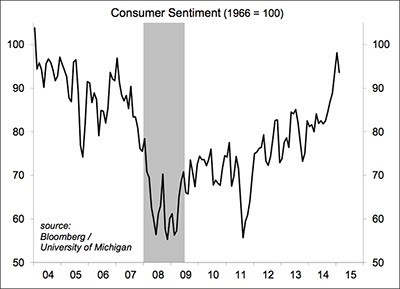 Consumer sentiment spiked higher in January, but fell back somewhat in the reading for mid-February. That’s not an indication of weakness. Rather, there is a fair amount of noise in the data from month to month. The overall trend is still significantly higher. More detailed surveys have long shown a wide difference in ratings of the economy by income. Those at the top have maintained a rosy outlook for much of the economic recovery, while those at the bottom of the income scale still see conditions as troubled. Those in the middle have grown more optimistic, the most since before the recession. Spring is the most important time of the year for the economy. It’s when most firms expand their hiring. Last year, for example, we added 4.4 million jobs between January and June (prior to seasonal adjustment) – that works out to an average of 880,000 jobs per month. Spring usually marks the seasonal peak in new home sales and construction activity. Housing has disappointed in this recovery, but anecdotal evidence points to a solid pickup in the near term. There is scope for substantial further improvement as housing activity works back toward normal conditions over the next few years. Most investors should be aware of the noise that seasonal adjustment can generate in the economic data reports. Most of these figures are based on statistical samples, which also generates some uncertainty from month to month. In setting monetary policy, Federal Reserve officials look at a wide range of economic data and also put a lot of emphasis on anecdotal information. That means looking beyond the noise as they attempt to judge the underlying strength. Contrary to what you may have heard, the U.S. economy did not add 257,000 jobs in January. That’s the seasonally adjusted figure. We actually lost 2.755 million jobs, which was a smaller decline than the year before (-2.811 million). Yet, while seasonal adjusted figures may often be looked at skeptically, the broad range of labor market indicators suggests solid improvement. These data also suggest that we still have a long way to get to normal. The Fed’s chief tasks will be to make sure we get there and to manage market expectations along the way. One shouldn’t put too much weight on any particular month of data, but almost all labor market gauges are reflecting improvement. Much of the pickup in job growth appears to reflect growing confidence among small businesses. Unadjusted payrolls plunge each January, reflecting the end of the holiday shopping season, school year effects, and weather. The January drop this year was smaller than in recent years. In retail, we lost 593,000 jobs (vs. -669,000 in 2014). The unemployment rate edged back up to 5.7%. That’s just noise. Labor force participation dipped in December, and then rebounded in January. At some point, as the job market improves, a lot of people currently on the sidelines (those wanting a job, but not officially counted as “unemployed”) should re-enter the job market. As a result, the unemployment rate decline is expected to slow. The employment/population ratio is a better measure of labor utilization. This rate is trending gradually higher (more so for the key cohort, those aged 25-54), but we’re still well below pre-recession levels. Moreover, we have a lot of underemployment. As workers move up to positions more commensurate with their education and skills, they leave openings for those coming up the ladder. 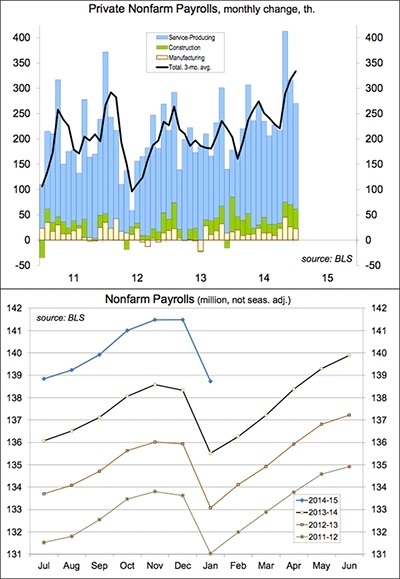 Labor market slack is evident in the lackluster trend in earnings. Average hourly earnings rose 0.5% in January, but that followed -0.2% in December. 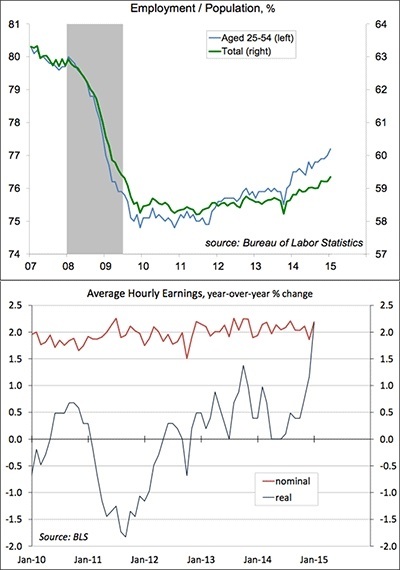 The Fed should be willing to tolerate a pickup in wage growth. However, some officials are more patient than others. Fed Chair Yellen should bring others to her viewpoint. She will deliver her monetary policy testimony to the Senate Banking Committee on February 24.